Diana Rattray. The Spruce Eats, 2006. This spinach and strawberry salad is a fresh and delicious salad. 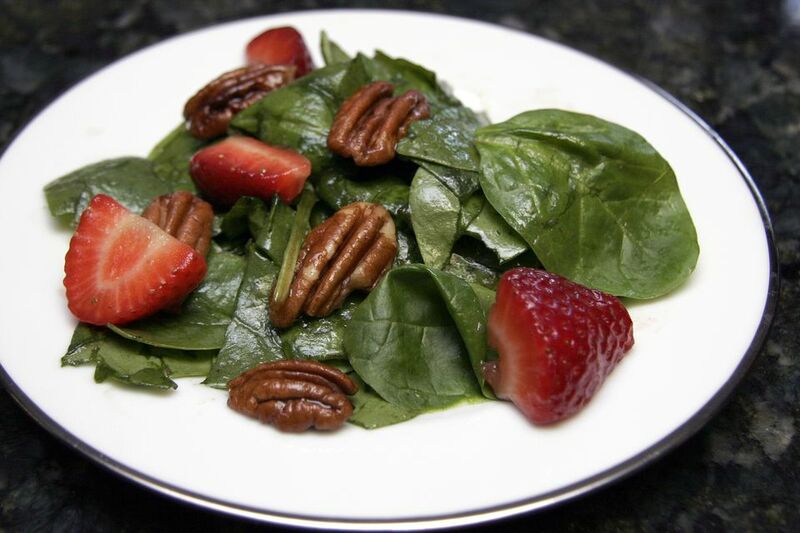 Fresh baby spinach, pecans, and strawberries make a surprisingly complementary and delightful combination. The pecans give the salad some crunch while the strawberries give it a burst of fresh flavor. For a more substantial salad, add some crumbled blue cheese or goat cheese. Bits of crumbled bacon would be wonderful as well. For a little extra flavor, toast the pecans. Or, prepare sugared pecans for the salad. You'll find instructions for both along with an alternative Dijon mustard dressing in the tips and variations below the recipe. Toss the spinach with the sliced strawberries, pecans, and cheese, if using. Cover and refrigerate until serving time. Put the balsamic vinegar, sugar, tarragon, onion and garlic powder, and mustard in a blender. With the blender running, add the vegetable oil in a slow, steady stream. Alternatively, put the dressing ingredients in a jar, cover with a lid, and shake to blend. Taste and adjust seasonings. When ready to serve, drizzle dressing over the salad and toss lightly. Toasted Pecans: Put the pecan halves in a dry skillet over medium heat. Cook, shaking the skillet and turning the pecans until the nuts are lightly browned and aromatic. Remove them to a plate to cool completely before you add them to the salad. Sugared Pecans: Melt 1 tablespoon of butter in a small skillet over medium-low heat. Add the pecans and stir to coat them thoroughly. Add 1 tablespoon of sugar and cook, continually stirring, until golden brown and the sugar has dissolved. Remove them to a wax paper or parchment paper-lined plate. Dijon Mustard Vinaigrette: In a jar with a lid, combine 1 heaping tablespoon of Dijon mustard, 1/4 teaspoon of garlic powder, 1 1/2 tablespoons of white wine vinegar, 1 teaspoon of lemon juice, and 1/2 cup of extra virgin olive oil. Shake vigorously; taste and add salt and freshly ground black pepper, as needed.